The Ultimate Darts Rules Guide: 10 Popular Games & How To Play Them! Okay, let's cover the basics first, and go from there. 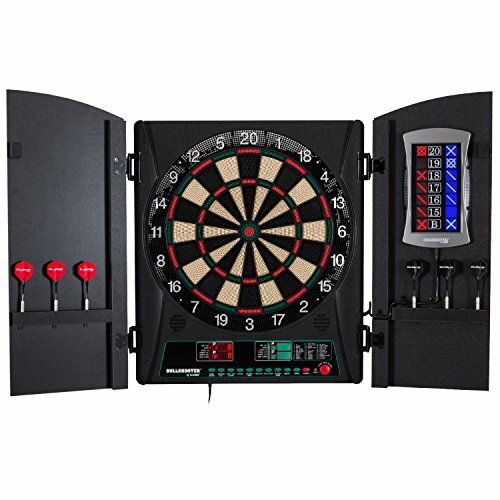 Besides the actual darts, one of the essential pieces of equipment you’ll have to set up is the dartboard itself. 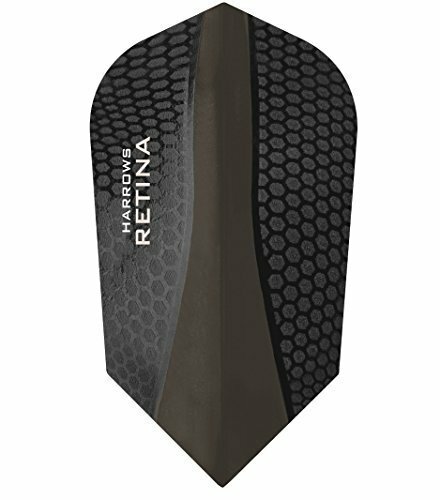 Whether you’re playing with the soft tip or steel tip darts, the height stays the same – exactly 5 feet 8 inches. You should measure that from the center of the bull’s eye. 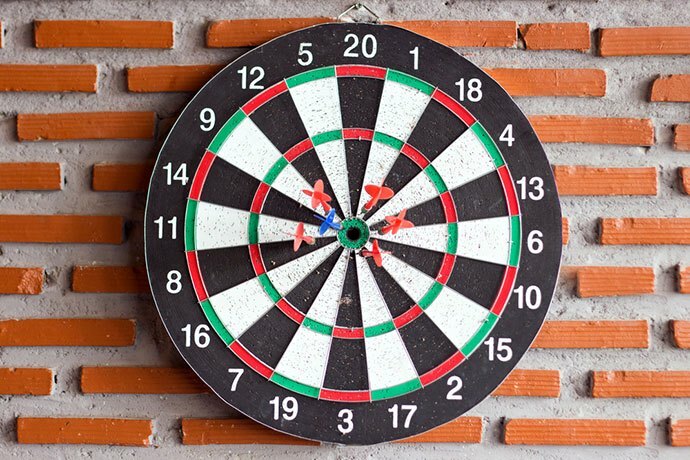 Pay attention to how you're mounting the dart board, too – it should be sitting flush against the wall. Also, the number 20 should be at the top. 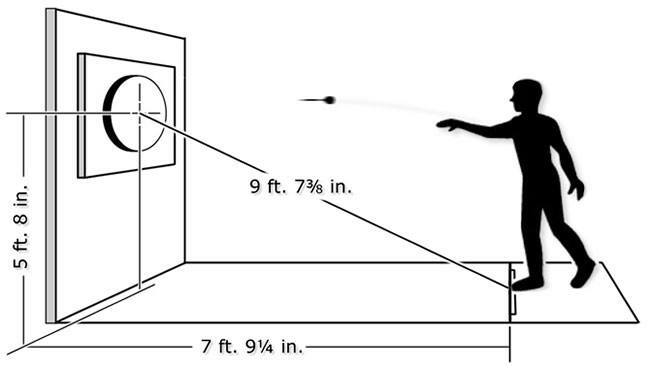 For games played with soft tip darts, the distance should be exactly 8 feet, measured horizontally. 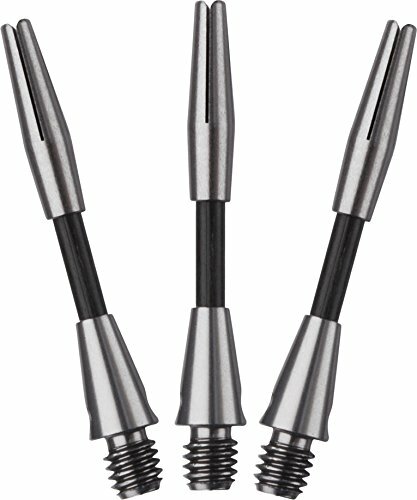 For games played with steel tip darts, the distance should be no more, and no less than 7 feet 9.25 inches. 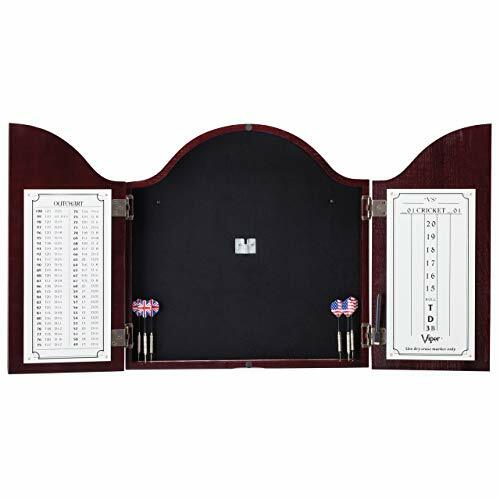 If you’re using a proper scoreboard, as opposed to a piece of paper, or a phone app, you should mount it either on the left, or the right to the dart board. One way to check the distance is to measure the diagonal line from the center of the bull’s eye, to the throw line – it should measure precisely 9 feet 7 3/8 inches. You can pretty much use anything to mark the throw line, as long as it’s visible to all players involved – even a piece of tape is more than enough. 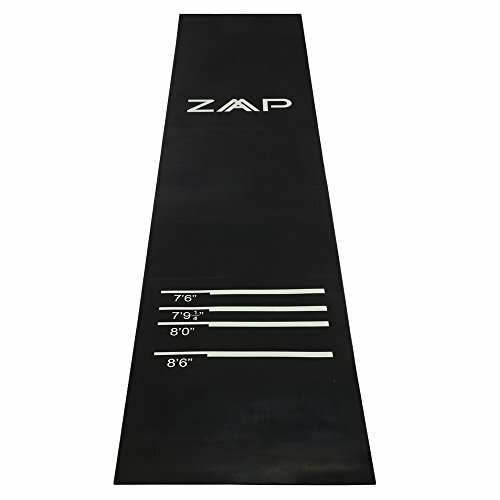 However, if you’re playing in a tournament, don’t be surprised to see a raised piece of wood, called the "Oche" or the "Hockey," used to mark the toe-line, instead. Well, almost always – but more on that later. When there’s more than one player involved, the standard way to decide who gets the first turn is to have all players throw one dart each, and determine who came closest to the bull’s eye. Each player is allowed three throws per turn unless they win the game in fewer than three throws. If you hit the double or the triple ring, the score counts as a double or a triple of the number in question. Bounce-outs don’t count, and the same goes for fall-outs – only the darts left “standing” at the end of each throw count. If you have a set total of remaining points, and you score above it, your throw will end automatically, and it will count as a zero. 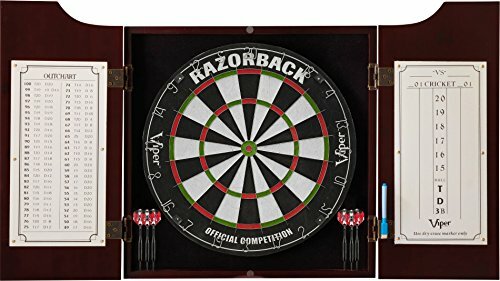 There are tons of different dart games you can play, and each one of them brings about a slightly different set of rules. Below, you’ll find a detailed breakdown of the ten most popular darts games and their respective rules. If you’ve ever seen someone play darts before – even if it was a casual Friday-night-in-a-pub type of game – chances are they’ve played cricket. Luckily, the basics of cricket are pretty straightforward, so they shouldn’t be too hard to learn, even for a total darts newbie! Number of Players: You can play cricket one-on-one, or you can split up into two teams. The rules don’t prevent more people from joining the game, as long as you keep the number of players on each side the same. Numbers in Play: The only numbers you should care about are 15 through 20, plus the bull’s eye. The objective of Cricket is to close the numbers in play, including bull’s eye, before your opponent – you need to hit the number three times to close it. Write the numbers 15 through 20, and bull’s eye, down in descending order, and use a “/” to mark single hits, an “X” to mark two hits, and an “O” to mark three hits – or a closed number. Numbers can be closed in any given order. When you close a number before your opponents, any subsequent hits that land on it go to your scoreboard total. 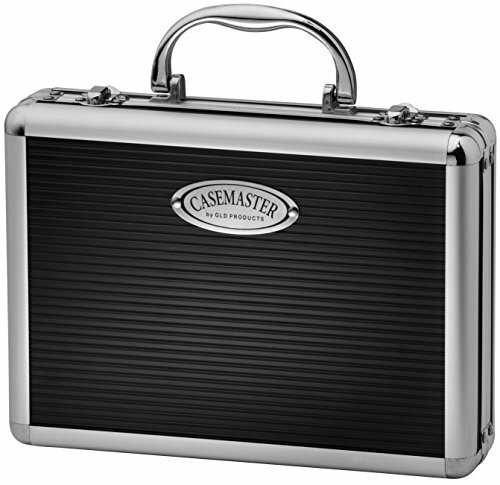 The player that manages to close the numbers in play, while obtaining a score that is higher than that of their opponent, is the winner. That said, if, by the end of the 20th turn, you have tied scores, the player who closed out more numbers on the dartboard wins. Try to close 20’s early on, before your opponent manages to do so – it will give you a significant advantage score-wise for the rest of the game. You can go for the bull’s eye right from the start. Worst case scenario, you’ll get a lucky hit or two on a different number, allowing you to focus your attention there. If you know your opponent, and you have a good idea of which numbers they’re going to target first, try to close them out before they do. 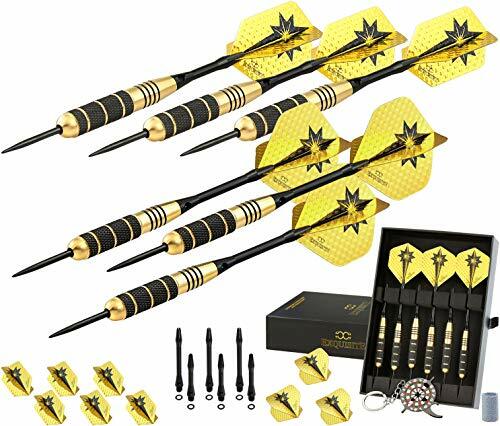 Featuring a fairly simple set of darts rules, the ’01 Games – such as 301, 501, and the like – will allow you to focus on your throwing, and work on your accuracy. Number of Players: As a general rule, there are either two people or two teams playing. Numbers in Play: The entire board is in play, but some numbers are more “useful” than others. The game begins with a set number of points for all players – 301, 501, or 701 – you name it. In each round, players throw three darts, and their round total is subtracted from their starting points. The goal is to reduce the starting points down to a zero – if the player goes below zero in their final throw, that’s called a “bust.” They then have to start the next round with the score from the previous one. The winner is the first player that succeeds in getting their score down to an exact zero. Always go for the strongest number that your skill level allows – that’s the only tip you need here! You go around the clock, aiming to hit each number in ascending order – simple, yet tricky enough to make it fun! Number of Players: You’re free to include as many people as you’d like. Numbers in Play: The game employs the entire dartboard. The bull’s eye is typically excluded from the game. 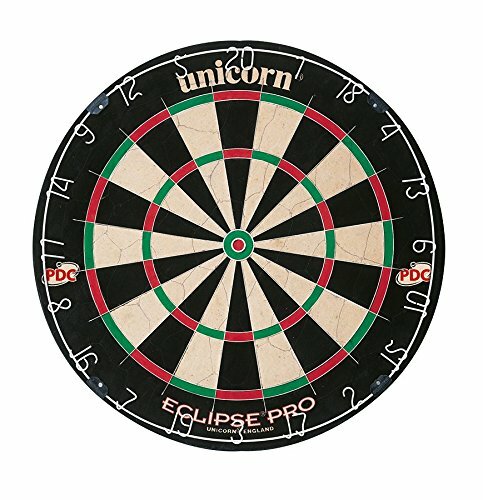 Players take turns to throw three darts each, aiming for specific numbers, starting with 1, and moving onto the next once you hit it. Any part of the number counts – including doubles and triples. Each player has to hit their numbers in ascending order. You can’t move on to the next number until you hit the one you’re aiming for currently. The first person to make it “around the world” – hit all numbers, 1 through 20 – is the winner. Unfortunately, there isn’t any – the game is pretty straightforward, so there’s not much room for strategies. You can play the game with only doubles or triples as hits that count. 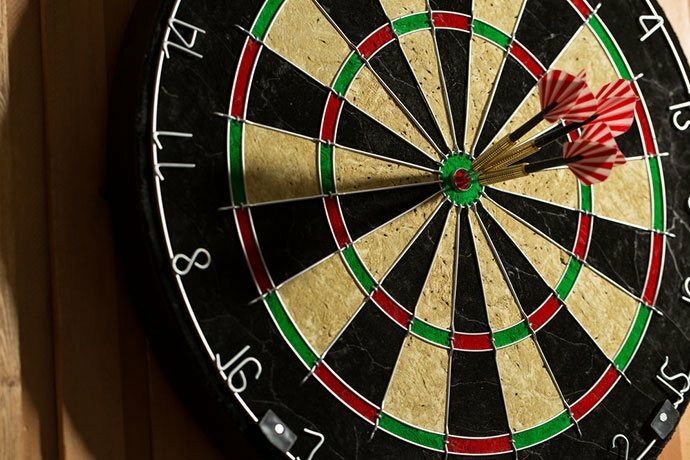 You can make hitting all three segments (single, double, triple) of a particular number a requirement for moving on across the dartboard – this move is known as Shanghai, and it’s usually reserved for the most experienced darts players. You can add the bull’s eye as either the starting or the ending point of the game, too. No, not that type of baseball – we’re talking about darts games here, remember? 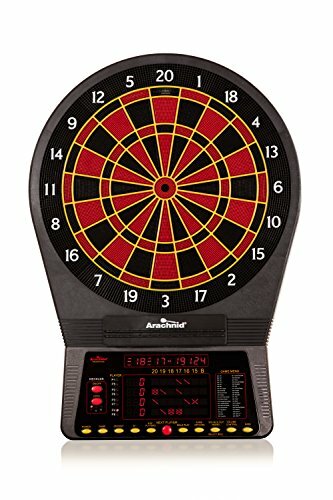 Number of Players: As a general rule, any number of people can play this darts version of baseball, but it works best if there are two or more people involved, and playing as teams. Numbers in Play: The numbers used are 1 through 9, although the game can extend beyond that limit in case there’s a tie at the end of the last (ninth) inning. Lay out the numbers 1 through 9 on the left side of the scoreboard in ascending order, with the names of the players involved at the top. 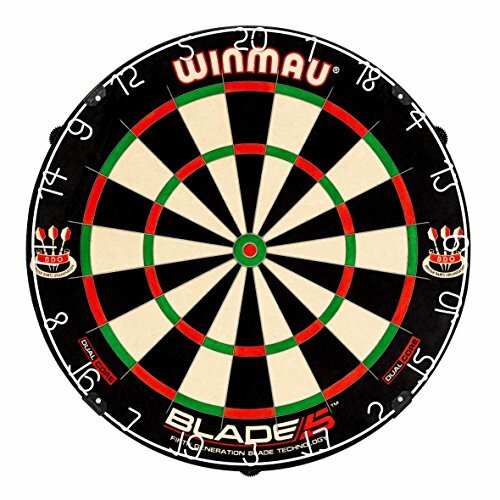 In each turn, the players throw three darts, aiming to hit the number of the current inning – and each number is only valid during the actual inning. You can’t score a four during the first inning and expect it counts later. Hitting a double ring results in two runs, and the triple ring equals three runs – remaining sections of the number only counts as one run. If you’re lucky – or skilled – enough, you can score nine runs in a single inning. Since the objective of the game is relatively similar to that of actual baseball, the player who scored the most runs at the end of the 9th inning wins. If, by any chance, there’s a tie, add extra innings (10, 11, and so on) until someone wins. I could give you a piece of pretty obvious advice – try to score as many runs as possible – but that’s it. Either you’ll hit the right number, or you won’t – and that’s all there is to it. Are you ready to become a Killer? I promise it’s not as sinister as it sounds! Number of Players: There are no rules, but I find this game to be more fun when there are at least three players involved. Numbers in Play: The numbers used are “selected” by the players themselves – you’ll see what I mean. 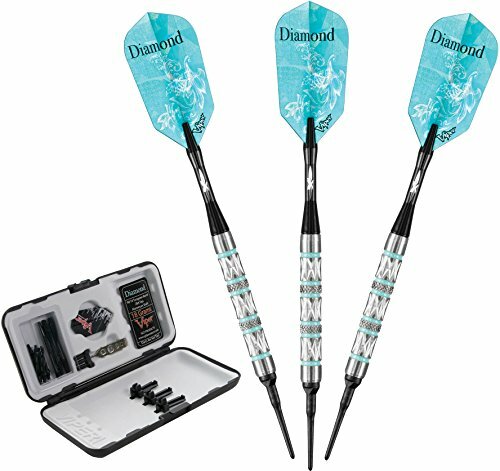 In the beginning, players will throw one dart each using their non-dominant hand. The number they hit becomes their number for the rest of the game. Each player gets three lives at the beginning. The goal is to hit a double of your number – once you do, you become the Killer. As a Killer, you can now try and “kill” your opponents by hitting a double of their numbers. Each time you score a double on your opponent’s number, they’ll lose a life. You can kill yourself if you hit a double on your number once you already became the Killer. The last player to have any remaining lives is the winner. During the initial “picking,” try to avoid numbers that are right next to someone else’s, because you could end up getting accidental kills from the rest of the players. If you become a Killer, try not to focus all your attention on one of the other players. Trust me, they’ll notice, and they’ll be out for revenge in the next game or two. 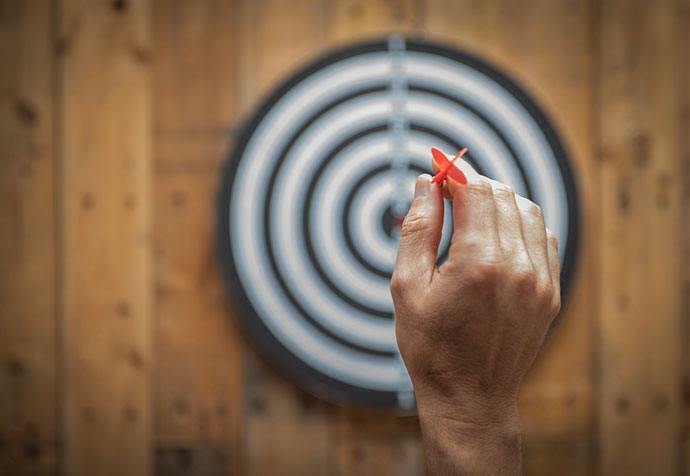 If you end up “picking” bull’s eye as your number, and you’re lucky (or skilled) enough to hit the double-bull, you can pretty much start celebrating – chances are you’ll win the game. Remember when we talked about Baseball? You’re going to notice some similarities between these two because they’re pretty much variations of the same game – you’ll see what I’m talking about in a moment. Number of Players: Any given number of people can play the game, although it tends to be more fun when there are several players involved. Don’t be surprised if you see a group of a dozen or so people playing Shanghai. Numbers in Play: Shanghai uses numbers 1 through 7, which corresponds to the number of “innings” in the game. Shanghai is pretty much a shorter version of Baseball, where players take turns aiming at numbers 1 through 7, according to the current inning. Numbers other than the inning number don’t count. The singles count as the current number of the inning, and if you hit a double or a triple, your score is two or three times that. Either by having the most points at the end of the 7th run, or by scoring a “Shanghai” – hitting a single, a double, and a triple, all in one turn. Unfortunately, there aren’t any real strategy tips to discuss here. Where does the name Halve-It come from, you ask? It has everything to do with the fact that you risk losing half your score in each turn! If you want a game of darts that will challenge you in all the right ways, this one’s it. Number of Players: You’re going to need at least two players to get things going. That said, if more than two people are involved, you can split up into teams, or play as several single players. Numbers in Play: All numbers on the dartboard are in play here, but they’re pre-established, and differ in each round. Start by determining the number of rounds (six, for example) and picking target numbers for each one. Rounds are played according to the predetermined order, and only the target numbers for that particular round count. Each time you hit the current target number, it adds to your total score. If all three darts miss the target number, you lose half your total score. If you want to make things more interesting (and challenging), you can throw in some variations into the mix, such as doubles, triples, colors, and hurdles. At the end of the last round, the person with the highest score is the winner. When you get to the single and double bulls, be careful – at this stage of the game, messing up could cost you your lead. Don’t get too caught up in falling behind. There’s always a chance of other players losing half their score, which could give you a chance to catch up. If you’re not careful, you’ll lose a leg. Number of Players: There are no specific rules, but in my experience, the game is a lot more fun when there are several people involved. Numbers in Play: All numbers on the dartboard are in play, but due to the nature and objective of the game (which I’ll explain in a moment) you’re better off aiming for 19 or 20. Start by deciding the order in which you’ll play, and note down the names of the players on the scoreboard accordingly. Each player starts the game with three legs. Whatever the first player’s total score is, the following player has to beat it – or they lose a leg. If you lose all your legs, you’re out of the game. The winner here is the last player left with any remaining legs – the last man standing if you will. Due to the nature of the game, the only real strategy you can have is making it as hard as possible for your opponents to beat your score – and you can achieve that by aiming for higher numbers, such as 15 and up, during your three-dart throw. Also known as All Fives, or simply Fives, Fifty-One by Fives is a fun darts game that will challenge you in more ways than one – it not only tests your dart-throwing accuracy but your math knowledge, as well! You’ll rarely see it played at the pub, though – I mean, who wants to solve math problems on their night out? Number of Players: Any given number of players could join in on the fun here. Numbers in Play: In theory, 51 by 5’s uses all numbers on the dartboard, but due to the nature of the game, you should only really aim for 5, 10, 15, and 20. In each turn, your score is decided by the number of fives you’ve hit – you take your points, divide them by 5, and the result is your score for the round, which then adds up to your total score. Here’s the catch – your score has to be divisible by 5. If it’s not, your score for the round is zero, and you move on to the next round with your old score. The first player to score fifty-one fives – with all three darts scoring on their last turn – is the winner. There’s no real strategy here – other than the fact that you should always make the numbers 5, 10, 15, and 20 your primary targets, that is. 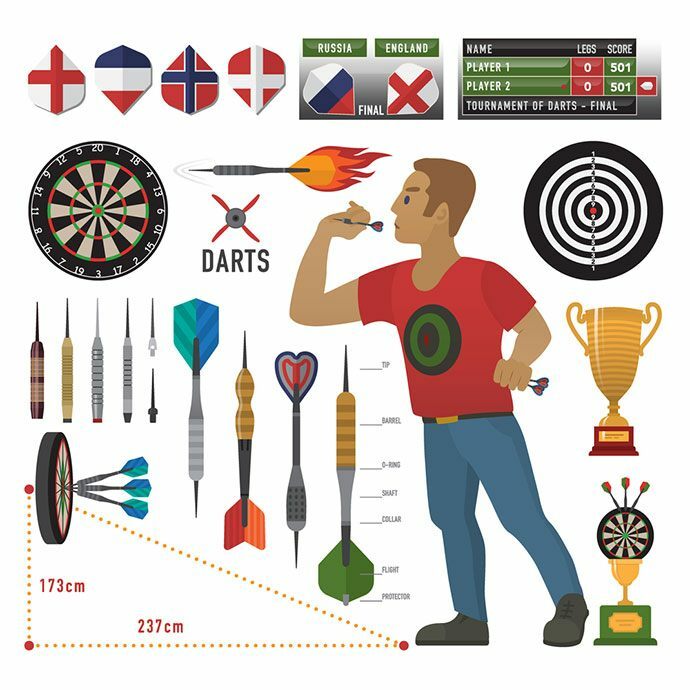 It’s not entirely different than “standard” Cricket, but there are quite a few differences to keep in mind when you’re playing the UK version of darts, also known as Bowlers and Batters. Number of Players: Either play it one-on-one or split up into two teams of two or more people – batters and bowlers. Numbers in Play: The main difference between the “standard” and English cricket is that the latter uses all available numbers on the board. However, due to the objective of the game, scoring higher numbers – and 20 in particular – is preferred. Divide the teams into bowlers and batters – the latter always play first. 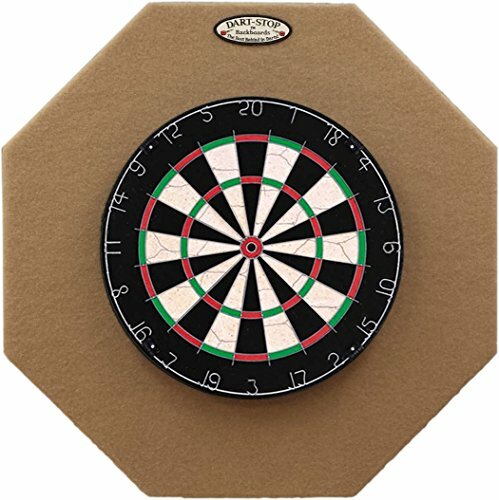 You should enter ten stripes on the dartboard to serve as wickets; with each bull’s eye you hit as a bowler, one wicket gets erased. The batters have a goal of scoring as many runs as possible while any wickets remain on the dartboard. Please note that only scores over 40 count towards the total number of runs. The game stops when all ten wickets are erased by the bowlers, at which point the batters write their final score on the scoreboard – and the roles get reversed. You play the game in two separate rounds so that every player ends up throwing one round as a batter and as a bowler. The end of round two determines the winner – whoever had the most points (or runs) during their round as a batter wins. There’s not much to strategize about here, except maybe for the whole bowlers vs. batters thing – some players prefer the advantage of throwing first. While there are tons of different darts games out there, the ten games mentioned in this guide are some of the most popular ones, which is why I figured it was important to familiarize you with their respective darts rules! Now, get out there, and impress your friends with your newly found knowledge! 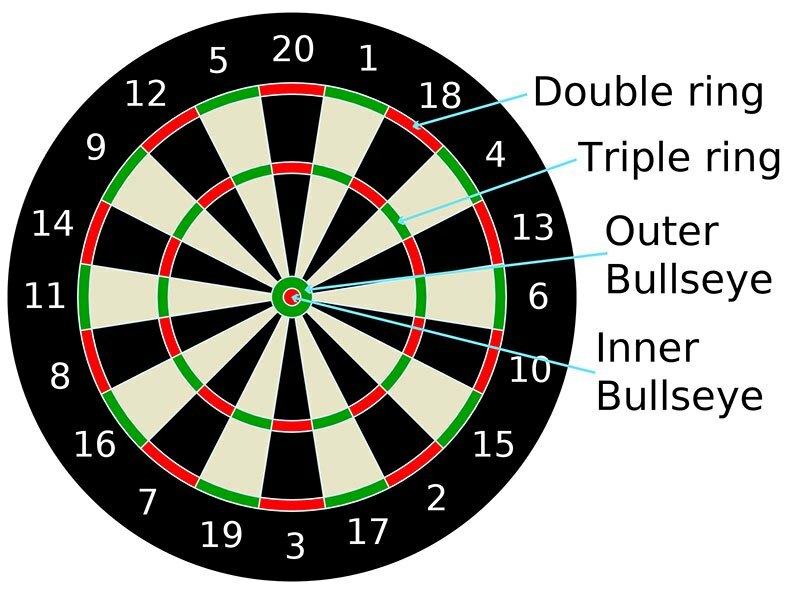 Did you find this guide useful, as in, you’re-going-to-nail-your-next-game-of-darts useful? Let us know in the comments below!